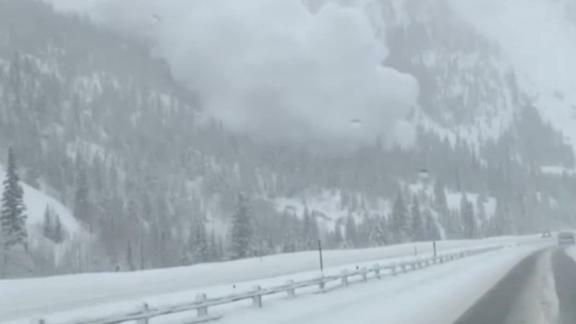 A massive avalanche that caused sections of an interstate to close was caught on camera by a Colorado driver. An agency in Colorado that tracks avalanches hiked its danger level to "extreme" for a swath of the state, the highest level on its scale. "Do not travel in the backcountry," the Colorado Avalanche Information Center tweeted Thursday. "Historic avalanches expected to valley floors." The extreme dangers are for Vail and Summit County, and the Sawatch, Gunnison and Aspen zones. Colorado has been beset by heavy snow and avalanches. Two deaths occurred there recently and an avalanche shut down a part of Interstate 70 and ruptured a natural gas pipeline. And on Thursday, an avalanche closed part of Highway 91. Spencer Logan, an avalanche forecaster with the Colorado Avalanche Information Center, said avalanches are "running bigger than the last 20 to 30 years" and in some cases bigger than the last 50 years. He expects avalanche dangers will be high through the weekend. The large amounts of snow that have fallen in short amounts of time have pushed slopes "closer and closer to the edge." "We're seeing more snow than we have for quite a few years," Logan said. Logan said the forecasts are for areas outside town limits and the backcountry, and roads will be affected. "Certainly these avalanches are having an impact on the highways," he said. Snowpacks become unstable with heavy snowfall and snow drifts and aggravates the threat of an avalanche. The Colorado Department of Transportation will do what it can to reduce avalanche hazards and ski patrols will be on alert. "Travel in, near, or below avalanche terrain is not recommended. Keep it simple and just AVOID the back country," the Friends of CAIC said on Twitter.